The Life of Bon: Locked Keys and Gummies. Me with my keys. We are together about .0001 of my life. Actually. I do know why it is so hard for me. Because I grew up in Price, Utah. And in Price, Utah you keep the keys in the car in the ignition and you never lock the car. That was car and key etiquette I was raised on and by golly, some habits are hard to break! I remember my dad actually scolding us kids if the keys weren't in the ignition when the car was parked in the driveway. Naturally, moving to the "big city" and having to lear to lock a car has taken a toll on me. But that's not the point. The point is that the city of Orem is awesome and if you lock your keys in the car you can call the Orem police department and they will roll their eyes at you and then come get the keys out of your car free as can be. Since April I have used this service three times. It's awesome that the city of Orem does this, but I can't help but wonder if I would have learned my lesson better by now if I had to fork over $100 every time I locked myself out of the car. What am I saying? Who wants to pay $100? But that's not the point! The point is that I bought a five pound bag of gummy bears while I was waiting for the copper to show his face. I was going to buy just a normal size bag, but it was 4.5 ounces for $1.49. Or I could get 60 ounces for $7.99. Such a better deal even if I have absolutely no need for that much gummy in my life. Now, I'm just wondering what in the world to do with five pounds of bears! Moving onward. What you will now read is probably the most adorable guest post I have ever had on my blog. It makes me want to be married for 16 years and look back at how far we've come and what little rascals our kids are. I guess more than anything, Laura's post made me realize how much beauty there is in every stage of life. It it made me want to soak in the beauty of this exact moment even more because life goes so freaking fast. Yeah yeah...I know...we have all done it before. It's a super busy day and we come across a guest post and click that little x on the top right. I promise I wont be too boring...okay at least that is my goal here. I am thrilled to be guest posting for the second time here on Bon's blog. It's not often I get to guest post so forgive me if it's a bit all over the place. I normally post over at Mice In The Kitchen. I would love for you to stop by and say hi. I have been blogging for just a little over a year and have loved every second of it. 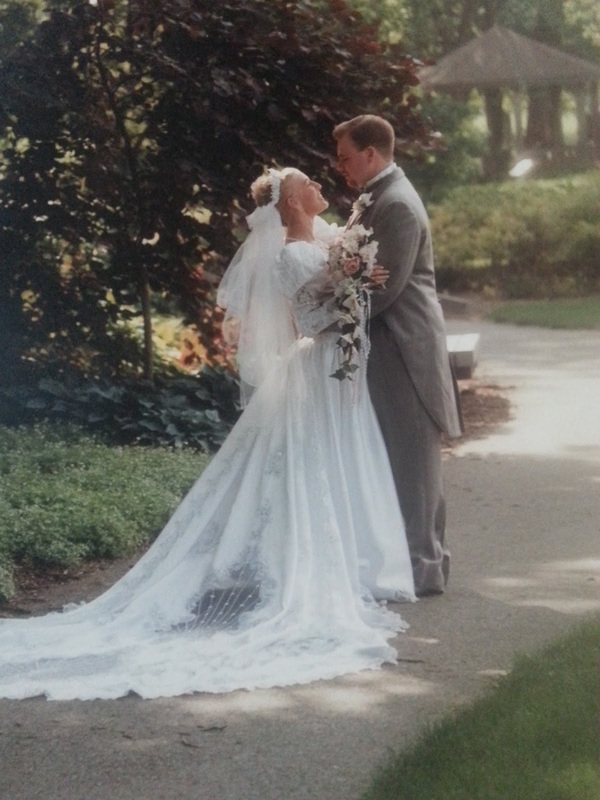 Recently my husband and I celebrated our 16 wedding anniversary (we started dating 21 years ago). I would love to say it was a wonderful and magical anniversary with a horse drawn carriage and roses everywhere...but that would be a lie. Now before you start imagining divorce papers and arguments about who left the toilet seat up for the millionth time please let me explain. We are actually very much in love so much so that you can not separate one of us from the other. Over those years we have been there for each other for hard times, we have fought our way through times when we were not seeing eye to eye, and hung tight to each other when it seemed like our world was turning upside down. Now it's so much easier to write that then it is to actually go through those things but I truly believe that God allows those test in a marriage so you can grow your love. You never can truly appreciate the good without going through some bad. In May we went on our very first small vacation away from the children. This was the first time I have ever spent one night away from our 4 kids..and of course we did what I am sure a lot of crazy parents do...we talked about them. One night though we had a bit different conversation. We had ordered room service and were watching TV and eating. We laughed about how quite the room was. So I reached over on the table and started to knock as if a child was knocking at the door . "mom.....mom...are you in there mom....mom ...mom ...where are you mom....dad....dad....are you in there dad.....dad....dad....where are you mom and dad." That of course made Tim roll his eyes and start laughing...he commented how now he felt at home. That started a conversation on how much our lives had changed. How different it was from when we started to date in High School, how even our young married (pre-children) life was so different from what it is now. When our first was born we had been married 3 years and took that sudden change between it being "we can do whatever we want" to "OH NO...I'm out of diapers." We made it through 4 children and almost 10 straight years of changing diapers...at one point we had three in diapers at one time. We now have started the first official teen years with our oldest who just turned 13. Yet our love for each other has never grown faint, never dimmed, we still kiss each night before bed and I watch him pull out of the garage every morning before work. That night for our 16th anniversary we put the kids to bed. I ran to Olive Garden and brought home the exact same meal we ate at our first "official" date which was our Homecoming dance our Sophomore year in High School. Yes, we had to tell children to go back to bed several times and had to avoid the glare from a dog who desperately wanted to share dinner with us but it was our anniversary....just the way we like it. Thanks so much to Bon for allowing me steal a spot on her blog and thank you so much to all of her followers for taking the time to read my guest post. Again, I would love for you to stop by Mice In The Kitchen and say Hi! hahaha you crack me up, everyday! I am always losing my keys as well. Though I have only locked them in my car once! I can honestly say I haven't locked my keys out of anywhere however when I was at work my husband locked himself out of the house and had to go sit at Steak n Shake until I was off before he could get back in - all because his parents gave us the emergency keys back and they couldn't help. My stepmom leaves the keys in her car all the time, and we live in big St. Louis so when her car does get stolen (Cause they do all the time) I'm simply going to tell her told you so! Thankfully, I haven't even locked my keys in my car, but I lock myself out of my house more times than I care to admit. And I LOVE your guest poster. So thankful to hear of a love that survives the chaos of life and is still just as sweet as when it started in high school! Maybe you'll stop locking your keys in the car after you lock it while it is still running. I did that once in high school. But the absolute worst time I locked my keys in the car was when I was pregnant with my second and locked my first in the car while at the grocery store. I cried and cried for the whole 15 minutes it took Ryan to come save me. That one taught me my lesson. Just be sure you don't leave that 5 lb bag of gummies in the car. That would be one sad, hot, melty mess! You just keep me giggle the whole time I’m reading your blog. It is good to know that there are still couples doing adventurous activities to enjoy life together as if they are newlywed. It is a fact that most couples tend to be very busy doing a living and rearing children in their married life.